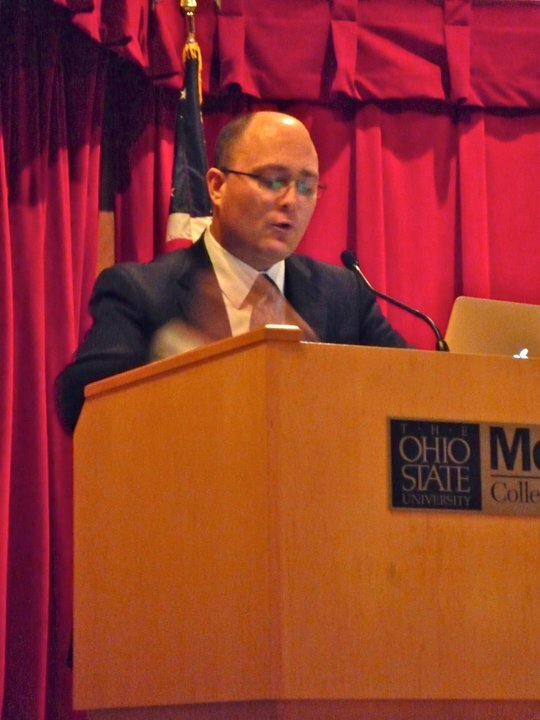 Last week I participated in a debate on IP at the The Ohio State University Moritz College of Law Student Chapter of The Federalist Society (Moritz College of Law, Ohio State University, Columbus OH, March 3, 2011). This was part of the “John Templeton Foundation’s Big Questions Debate series on Intellectual Property and Wealth Creation”; I debated patent attorney and adjunct IP law professor Steve Grant, who represented the pro-IP side. I recorded it on my iPhone; audio file is here (32MB; the version from the camera’s recording is here), though a video version with possibly better audio should be available soon. Professor Grant did his best, but didn’t have a solid argument for IP other than the standard “I think we should reform IP but not get rid of it.” My opening speech is about 15 minutes and has decent audio quality, and is a summary of a hard-hitting version of the basic libertarian case against IP law (here is the powerpoint presentation I used; embedded version below). Grant’s speech is audible but I was not very close to him; but his conventional and unsystematic, more empiricist and positivist than libertarian and principled remarks will be of only mild interest to libertarians. For my 10 or so minute rebuttal to him, I left my iPhone at the table but it’s still audible; for the Q&A period, it was in front of me so it’s decent again for that part. My host was Aman Sharma, a very staunch libertarian law student and head of the student chapter of the Federalist Society. When I was involved with the Federalist Society (lawyers chapters) in Philadelphia and Houston they were populated with mainly Newt Gingrich loving neocons; good to see some Austro-libertarians infiltrating their ranks. Sharma told me “I had a lot of fellow students approach me after the event with questions showing a new-found interest in the Mises/Austrian worldview.” That is cool and gratifying. 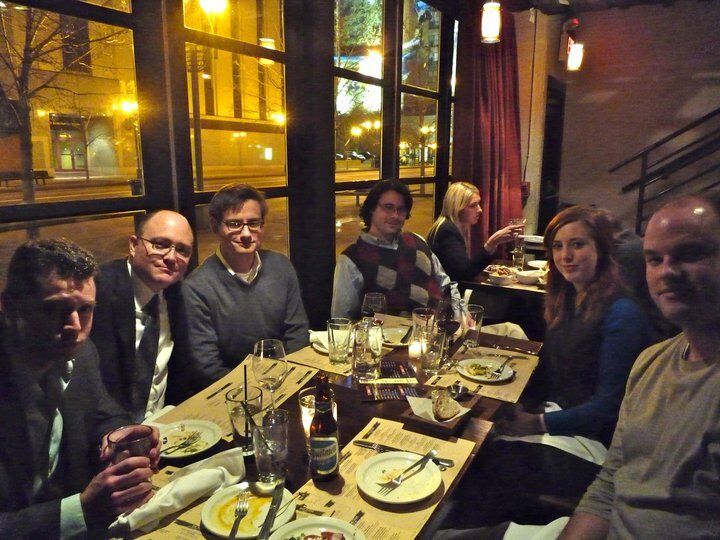 While in Ohio, I met my friend Jacob Huebert and other local libertarians/Federalist Society people–including Katelyn Horn and Maurice Thompson, of the 1851 Center, for dinner at Barrio Tapas. A fun trip, and great people. I looked at your Power Point. The last part reminded me of a prediction by Joseph Smith about our current day. Sadly, both of you are right. This fool law that mistakes ideas for property should be abolished or rethinked. NB The word ‘rethink’ is NewSpeak: To repeat the traditional thinking upon a controversial subject or problem area, as if expecting a different conclusion or solution – but in the knowledge that the outcome will be at most a refinement of that on each previous occasion. See Rethink Music – Per Tradition.